This is classic! Back to basic work of pounding sambal with a mortar, manually made Sambal taste better and tastier rather than food processor, am i right?.hehe.....well, no cheating for this. I usually make sambal in last minute, so i prefer the cheating way using food processor to do the cutting/blending/mxing job. 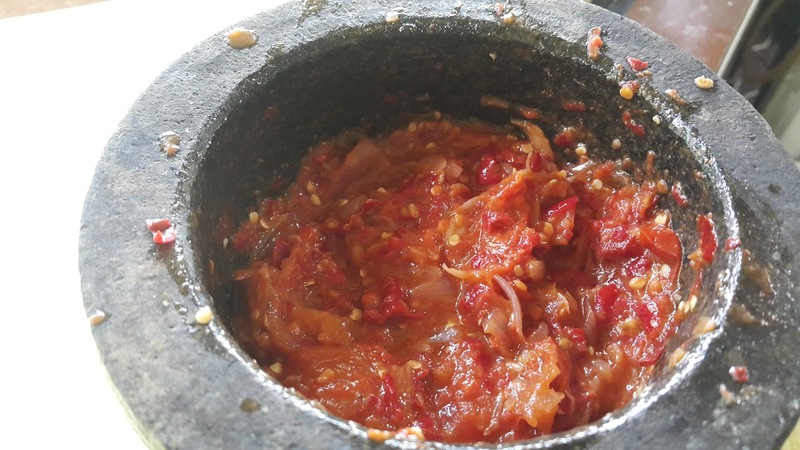 For this sambal, i do not want to do the short cut way since i have plenty of cooking time! no cheating indeed, i want my sambal taste so authentic just like how my MIL did, she patiently use her Indonesian Pestle/Mortar pound until it all coarsely mix and combine, that is why her sambal always taste better :) This Sambal use only fresh chilies that no need to be cooked, i pick some mild chilies that is rather not too spicy! 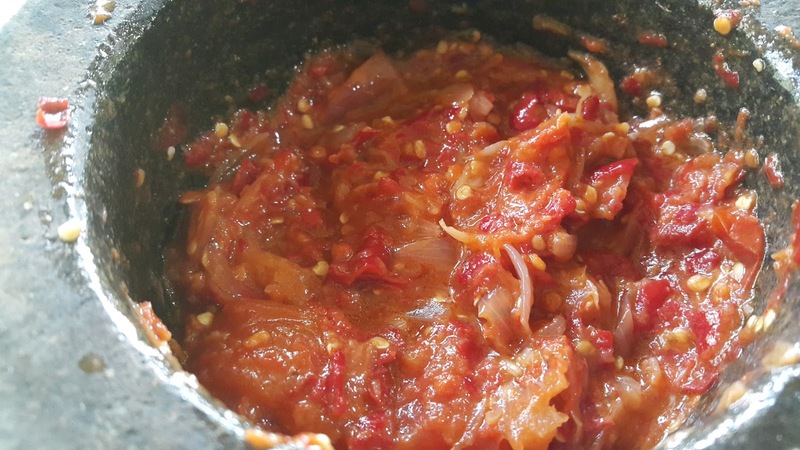 If you love extremely hot, you can add more little hot chili into this sambal. Now we do not need to cook the chilies. The only thing we cook is shallots, garlic, belachan/terasi and the tomato. Talking about it, i feels like dig into it, oh..dear! This sambal goes well with all kinds of fried dishes - fried fish, ikan bakar, fried chicken, ayam bakar, fried tahu, fried tempe or simply just anything! Mamamia! Lets get into the recipe. 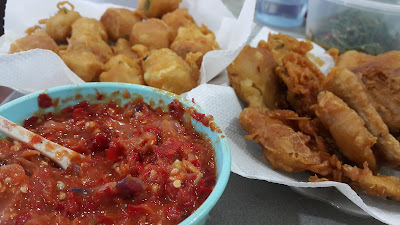 * Clean and coarsely chopped cabe keriting into smaller pcs and pound coarsely set aside. * heat 1/4 cup cooking oil, add in shallots, garlic, tomato and belachan, let it cook with oil slowly until it is soft and dish up. * Pound shallots with chilies slowly and continue with the rest of the ingredients until all combined add in salt and sugar to taste. dish up and squeeze kaffir lime juice into sambal, served. 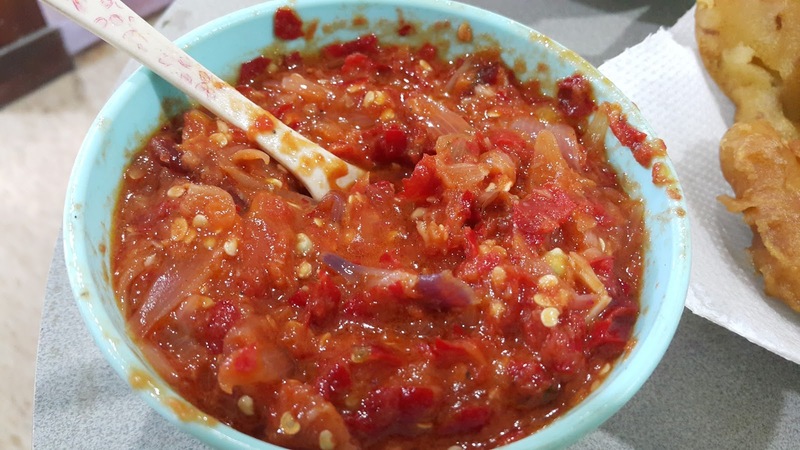 * store sambal into a clean container up to 3 days in the fridge.